The one thing all bloggers want to know is how to make money blogging. We see these blog income reports where people are making $50,000+ a month on their blogs. How do they do it we think? How do they make that kind of money blogging? I feel that many will not break down their exact strategy of how they make money blogging. Unless you pay them for it of course and I want to change that! I want to share with you how I went from making $59.66 blogging in July to $2,047 in August. These 13 steps are the exact steps I took to start make money blogging with my small blog using my own program. Before you can make money blogging you must define your niche. This should be a key part of your blogging strategy. Who are you writing to? What do they need from you? What do they want to learn? These are all questions you must answer before you can make money blogging. One thing I have my clients do is write a story about their niche. Give that person a name and write her story. Write who she is, what she needs, what her life is like, how you can make her better. Instead of focusing on one huge niche, write one person’s story. When you do that it becomes clear who you are writing for and who you need to go out there and find. For me, I knew my niche is women bloggers that want to grow their blogs, help people, and make money blogging. They are women between the ages of 28-65. They are passionate about helping people through their writing. The majority of them are moms. They want more traffic to their blogs but they struggle to get it. They don’t have a ton of money to spend on courses or programs. They also don’t have a lot of time to blog. They are fitting it in during the fringe hours. They want to make money blogging but aren’t sure how to. But they see the possibility as wide open! Once I knew my niche I had to go out there and find them. I had to find out where they were hanging out online. Were they in Facebook groups or on Twitter? Could I engage with them on Pinterest? I knew that to make money blogging I had to go out there and find my people. You can’t just create a product or a course, put it on your blog, and hope people will find it. You have to be active about getting people to your awesome program or course. To do that, you must go out there and find your people. Find your niche and where they are hanging out online. Now that I knew where my niche was hanging out, it was time to get to know them. In my Women Winning Online Facebook group I started to ask questions. In other blogger groups, I asked more questions. I asked what they were struggling with, what they wished their blogs would look like. I asked “if you could wave a magic wand over your blog, what result would you like to see?” I made a Google spreadsheet and I kept track of every answer. Then I looked for the questions they were asking in my group and other Facebook groups. I made a note of those questions. I also took the time to engage with my niche and answer those questions. You must listen to your niche, really listen to them, if you want to make money blogging. Engage with them, get to know them, share your expertise with them. Above all else pour value into them and help them. Bonus offer:click arrow button to get your 13 Step Checklist to Make Money Blogging! While I was doing all this niche seeking and learning, I was also building my email list. I knew that they key to any successful launch is having an email list. I knew that 20% of my email list would buy my program. Out of all 13 steps building my email list was the most important step. In two months I built my email list to over 500 people. By the time I launched Find Your Tribe Online in August, I had an email list of just over 800 people. In that post I explain how I built my email list so fast. Figured out what my niche was struggling with. Put the opt-in offer on a landing page. 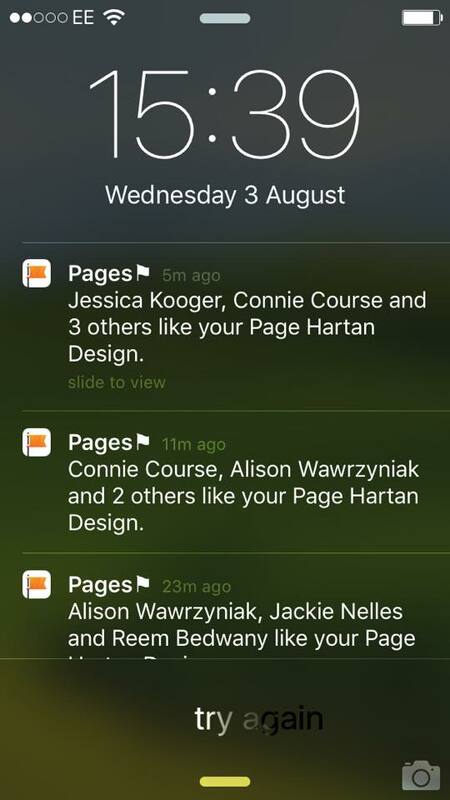 Shared that landing page in a ton of Facebook groups including my own. Put that link in my bio when I did guest posts. Pinned the landing page on Pinterest. I also made sure that building my email list was my number one priority. I knew how important my email list would be to the success of my program. I am huge on sending surveys to my niche. I love to ask them open-ended questions about what they need, what they want. In the last six months I have sent two surveys to my audience. I send them to my email list and share them in my Facebook group. People have been kind in filling out my surveys! One of the main reasons I love doing surveys is the answers always surprise me! I always think I know what people want, or more correctly, I assume I know what they want. But there are many times I learn what people need through these surveys. This is where most bloggers go wrong when trying to make money blogging. They assume they know what their audience wants. Then they create a product based on that assumption and then get frustrated when it doesn’t sell. Trust me when I tell you, if you know exactly what it is your niche wants, your product will sell like hot cakes! If you assume, it will fall flat and that is depressing. Ask your audience what they want, don’t assume and give them something they don’t need. Once I did the research, had enough data, I started to brainstorm product ideas. This can be the tricky part. When you are working on ideas for your product you have to be careful to accurately read the data. Again you want to make sure to create something that people are asking for, not what you assume they need. Put all questions in a spreadsheet. Put the correlating answer underneath each question. Looked for the most common problem, the most common struggle. Brainstormed how to solve that problem. In my case I saw that the thing my niche struggled with the most was getting more traffic for their blogs. I wanted to create an action based program that would help them get more traffic. I know the quickest way to get traffic to your blog is to get exposure to it. The quickest way to get exposure is to find your people online and build your tribe. And with that, Find Your Tribe Online was born! Here’s the trick to this email though. This wasn’t the first email I had ever sent my list. By the time I launched Find Your Tribe Online I had sent a weekly email out for 16 weeks straight. I never missed one. I also put a ton of value into each email every week. Are you sending out a value packed email each week? It’s a must if you want to make money blogging. I can help you with this through this worksheet. Trust me, you want to fill this worksheet out and use it for your email newsletter. My weekly emails accomplished two things. First, my email subscribers were used to hearing from me. I didn’t just add them to my list and only email them when I wanted something. No, I first gave them value before I asked for anything. Second, I believe that if you give enough value to people, it is perfectly okay to ask for the sale. But this is only after giving, giving, giving, and then giving some more. Help people first, truly help them, then ask for the sale. That first email went out at 2:30pm Monday, August 1st. By midnight that first night 25 people purchased Find Your Tribe Online. Over the next two days, 9 more people purchased Find Your Tribe Online from that first email. From one email I had 34 sales of my first program– I was stoked! The next thing I did was announce Find Your Tribe Online in my Women Winning Online Facebook group. At the time there was about 800 people in Women Winning Online. The hard part about launching in a Facebook group is I don’t know how many people purchased from the group. Did I have an overlap of people who purchased from the email but were also in the group? If I could do it over, I would have used a link shortner like Bit.ly to track how many clicks came from my Facebook group. The number one mistake bloggers make when launching a program is only sending one email about it. We are busy people! We don’t always have time to read all our emails. We also don’t always act on that first email we receive. Often we think about it, and think about it some more before deciding to buy something. This is especially true when we are buying something online. I knew that in order for Find Your Tribe Online to be successful, I needed to send more than one email. Lucky for me, the first people to buy Find Your Tribe Online were having tons of success with it. Their testimonials gave me good content for my follow up emails. 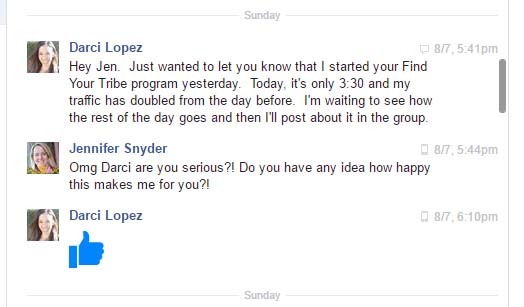 Follow Up Email #1: Facebook testimonial, Sold 6 more copies of FYTO. Follow Up Email #2: Tripled traffic testimonial, Sold 19 more copies of FYTO. Follow Up Email #3: Combined three different testimonials, Sold 3 more copies of FYTO. Because of those follow up emails I sold 28 more copies of Find Your Tribe Online! When you launch a program, make sure you have an email launch sequence in place. You want to follow up with people who don’t buy right away. Doing this you will earn many more sales for your program that you might not have otherwise! Like I mentioned above, I send out a weekly email every Sunday morning without fail. Even after we got home from vacation late on a Saturday night, I still sat down at my computer and typed out my email newsletter. In the email newsletter I answer a question from the Women Winning Online Facebook group. Then I add a list of any blog posts for the month. Short, sweet, and most important– helpful information. Then the last thing I do is add in my postscript aka the P.S.. When I launched Find Your Tribe Online I always included it as the P.S.. I did one of two things. I added a benefit of why FYTO would help them grow their blog. Or an actual testimonial from someone who had success with FYTO. In August I generated 6 more sales from the three weekly emails with a P.S. about Find Your Tribe Online! Many bloggers are hesitant to have affiliates help them sell their programs. They worry about not getting all the money from the sale of their programs and having to share it with others. My affiliates are my sales team. They are out their advocating for Find Your Tribe Online. They are out there saying how great it is, how it has helped them. They are my own personal sales team! I also believe that my affiliates bring in sales for Find Your Tribe Online that I wouldn’t have gotten. First, they have their own email lists, Facebook groups, and audiences to share FYTO. I more than likely don’t have the same access to their audience. Plus they have built up a trust with their audience. They are going to believe what the affiliate says about FYTO because they trust that person. They may not know me at all but still bought FYTO because they trust the affiliate promoting it. Second, affiliates can promote in other Facebook groups in a way that I can’t. 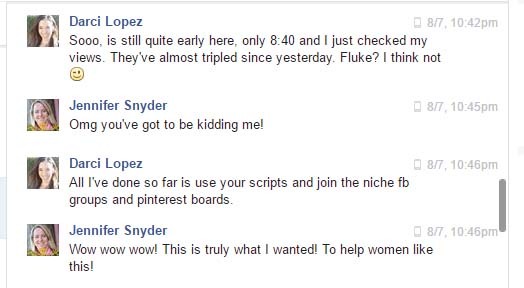 For example, if someone in a Facebook group asks about the best Pinterest boards for bloggers, an affiliate could share their link to FYTO without punishment from the admin of that group. Now if I were to share the same link, it could be seen as a promo by the admin and I could get banned from the group! Also, the affiliate will share in the group that Find Your Tribe Online helped them. It is seen as sharing a valuable resource with other bloggers. If I were sharing FYTO, it could easily be seen as me just trying to sell something or promote myself. If you worry about sharing sales with your affiliates I have one thing to say. There is plenty of money to go around, plenty of sales to go around. I can tell you nothing makes me happier than seeing my affiliates do well from something I have created. I feel like we can celebrate together! My affiliates rocked it the first month Find Your Tribe Online was live! I launched the affiliate program on August 11th and by the end of the month I had nine affiliate sales! There is something powerful about testimonials. It’s part of why Amazon is as popular as it is. We want to review things before we buy them. We want to know it has worked for someone else. We don’t want to invest our money into something only to find out it is going to be a waste of money and time. My client Tania received 5 new Facebook likes to her business page in 25 minutes using Find Your Tribe Online! I know for a fact these two testimonials drove in more sales for Find Your Tribe Online. I was lucky, both Tania and Darci messaged me with their results. If you aren’t getting testimonials from your clients, I recommend you reach out and ask for them. 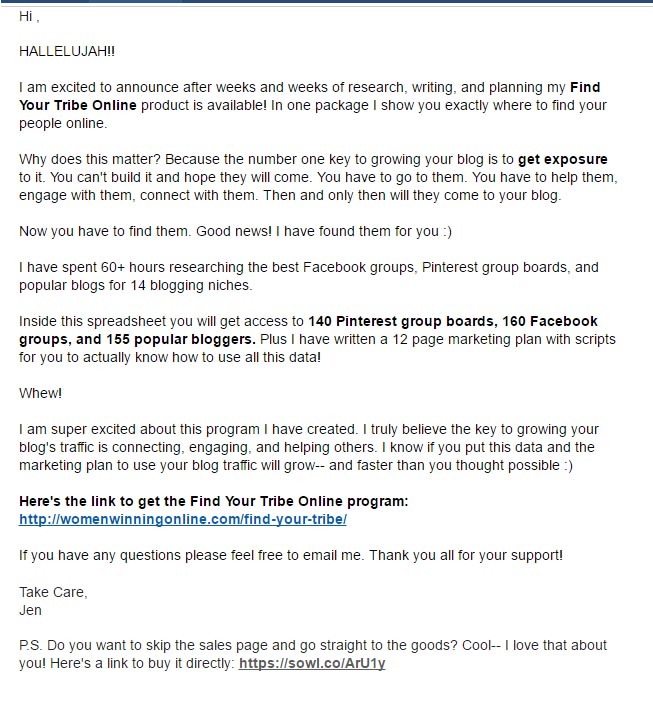 I have saved every single testimonial I have received for Find Your Tribe Online. You can see a lot of them on the sales page here: https://www.facebook.com/groups/womenwinningonline/! When I launched Find Your Tribe Online I sold it for $7. Yup seven dollars. Almost immediately I heard from six people who had purchased it that I had priced it too low. They were concerned that I was selling to for much less than what it was worth. I had a starting point of seven dollars for a reason. I wanted to see if I had a minimum viable product. I wanted to see if my audience, my tribe, would in fact buy something from me. I wanted to see if what I was offering to them was of value to them. All the online marketing experts tell you to create a minimum viable product and sell it for seven dollars. Wow. There it was in black and white. I wasn’t charging enough for Find Your Tribe Online. Between those six people, my new coach, a few blogging friends, and that comment, I decided to increase the price of Find Your Tribe Online. It was less than a week old and I decided to go from $7 to $17 for the program. Before I made the price change I announced to my email list and in Women Winning Online that I was increasing it by $10. On Monday, August 8th I announced the price increase would happen that Wednesday. Between the 8th and the 10th, 30 more people purchased Find Your Tribe Online. Don’t be afraid to sell your program low to find out if people will buy it. Once you have a winner on your hands, do not be afraid to raise the price. A sense of urgency (closing the cart, raising the price) will get people to jump off the fence and buy. The $64,000 question is “How do I make money blogging?” Yes you can make money through affiliate income and through ads. But that can take forever to build up an audience that would make you a decent income. I knew this which is why I first focused on finding my niche, building my tribe and my email list. I then took the time to really listen to what my tribe wanted and brainstormed how I could help them. Once I found the perfect solution I created a marketing plan to launch my program. I used the power of my email list, affiliates, and testimonials to increase my sales of Find Your Tribe Online. This proves that you don’t need a large audience to make money blogging. Just one that you have helped time and time again. One that trusts you and believes you are the expert that can help them! What are your steps for making money blogging? What has or has not worked for you with your blog? Have you created your own product or are you nervous about doing that? Please share your thoughts in the comments below! You are so sweet, Suzi, thank you! As moms we can build successful online businesses! Look out world! Great list of steps. I’ve been toying with the idea for some time. Definitely coming back to this later. Thanks! You’re welcome, Catrina! I hope this helps you with the decision and look forward to hearing how it goes! What a fantastic post. I absolutely LOVE how you broke it down into very easy-to-digest steps for new bloggers. I’m right there with you with needing to build a tribe of loyal followers before you can really succeed with any monetization strategy. That’s something I’m doing over on my blog and I’m amazed by how loyal this group of mama bosses are! I don’t have the time to launch a course, but I’m thinking of ideas and maybe sometime next year 🙂 For now, I’m happy with just providing straight up value. Thank you for the feedback, Elna! The mama bosses are an incredible group of inspiring, loyal followers. It sounds like a great strategy and you are so right about providing value to your followers! I am a newbie mom blogger. I always try to learn how to improve my blog, page views, and how to monetize it. This is an awesome article. Also, a guide for newbie bloggers likes me to learn how to monetize my blog. Thank you so much for sharing these tips. Thank you, Soumya! First, congratulations on your new blog! It can be both exciting and overwhelming! I’m glad to hear you found the article helpful as a framework to monetize your blog. Thank you for commenting! You have helped break this down is a very easy and useful way. First find my niche and take it from there. Thank you! I am so glad that you have found this helpful and look forward to hearing your progress with your niche and monetization! Thank you for commenting! This is so fantastic! You really do give, give, give to gain people’s trust and loyalty. Thank you!!! Thank you, Laura! I believe it is so important to reach out to people while helping them reach their goals. Thank you for commenting! I actually subscribe to your list so I watched all of this happen from the sidelines! I’d have bought your program, but I’m trying to sell fiction and none of the niches matches what I’m trying to do. But it’s great to see how you made it happen! LJ, I thank you for subscribing and for your kind words! I appreciate your support and feedback and wish you nothing but the best with your niche! I am going through all of these one by one!!! Hoping to start monetizing by next month!! Thank you for your amazing content and inspiration that this is possible!!!! Thank you for your sweet words, Kemi! 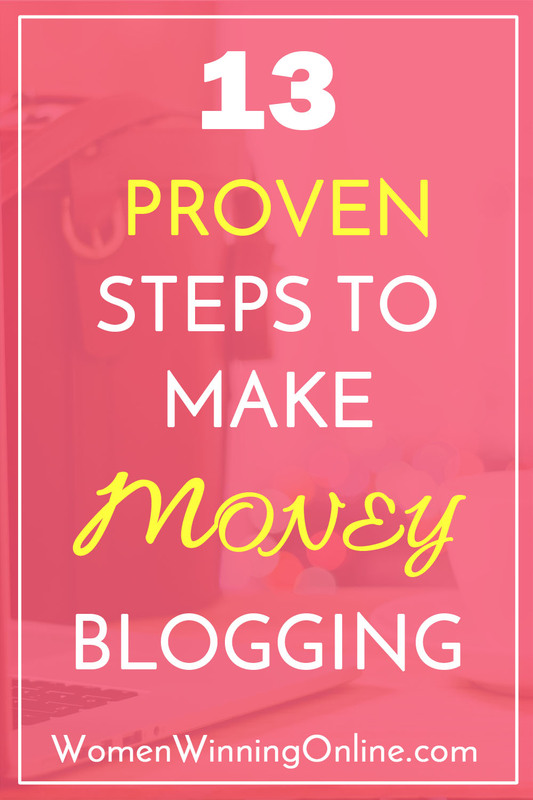 I am so happy to hear that the 13 Proven Steps to Make Money Blogging is helping you! I look forward to hearing your progress and your words motivate me to continue helping others. Thank you for commenting! Jen, you are always so helpful with your tips and I learn so much from you! I am really trying to work on building my email automation. How to you organize and find the time to email your subscribers weekly? Do you plan out that content for the month or just as you go? Thank you again for all of your wonderful resources! Oh thank you so much Brittany! I truly love being able to help women like you with my writing. It’s so fun and an honor too! As for email, every Wednesday or Saturday morning, depending on the week, I sit down to write my email newsletter. I find that I have such a system now that it takes me 15-20 minutes to write. I take the questions from the Women Winning Online Facebook group and answer. This year I am going to try to match the questions to the blog content for each month. If you ever need help with email please reach out to me— I am happy to help you! Wow, love how detailed you are!! Pinning! Thank you, Carmen! Glad you found the post helpful and thank you for commenting! I am hoping to really grow my email list this year too. I am working on my freebie and then hope to have a paid product later this year. It sounds like you are on the right track, Kristin! As you work on your email list and freebie, be sure to let me know if you have any questions. Thank you for commenting! I just found your site and it’s loaded with tons of information. I have to admit that I haven’t placed enough emphasis on my email list. I sat down this weekend and created a landing page for my optin page. Now I link to that whenever I write a guest post. This past weekend, I finally got the most optins in one day. I am so happy. Today, I am going to sit down and create a Pinterest graphic and link it to my new landing page. Hopefully, that will help me grow my email list. I’m starting to take growing my email subscribers more seriously from this point forward. I don’t know why I waited so long to do this? That’s awesome, Susan! I’m so glad this post helped to inspire you to work on your email list and that you’re seeing results already! Also, I want to thank you for your sweet words. 🙂 Please feel free to contact me if you have any questions. I would be more than happy to help! Grab your 13 step checklist here and let me guide you on how to start earning an income on your blog! Don't worry, I don't like spam either and your email address will be safe.